, an eminent painter, sculptor, and architect, was born in 1276, at a village near Florence, of parents who were plain country people. When a boy, he was sent out to keep sheep in the fields; and, having a natural inclination for design, he used to amuse himself with drawing his flock after the life upon sand, in the best manner he could. Cimabue travelling once that way, found him at this work, and thence conceived so good an opinion of his genius for painting, that he prevailed with his father to let him go to Florence, and be brought up under him. He had not applied himself long to designing, before he began to shake off the stiffness of the Grecian masters. He endeavoured to give a finer air to his heads, and more of nature to his colouring, with proper actions to his figures. He attempted likewise to draw after the life, and to express the different passions of the mind; but could not come up to the liveliness of the eyes, the tenderness of the flesh, or the strength of the muscles in naked figures. What he did, however, had not been done in, two centuries before, with any skill equal to his. 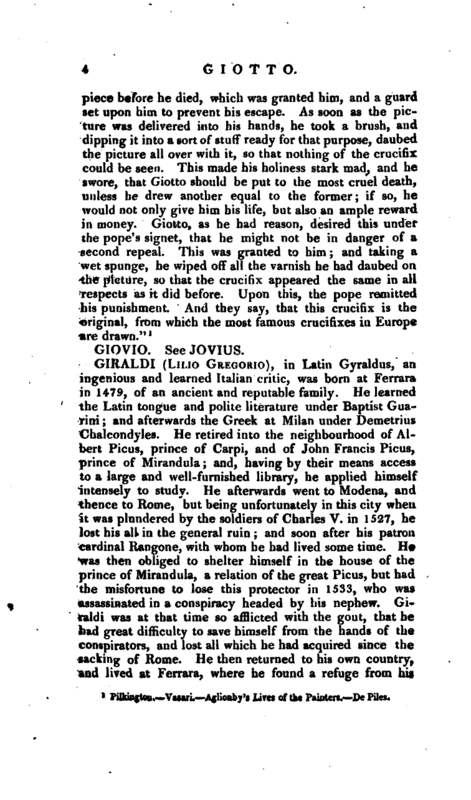 Giotto’s reputation was so far extended, that pope Benedict IX. sent a gentleman of his court into Tuscany, to bring him a just report of his talents; and withal to bring him a design from each of the Florentine painters, being desirous to have some notion of their skill. 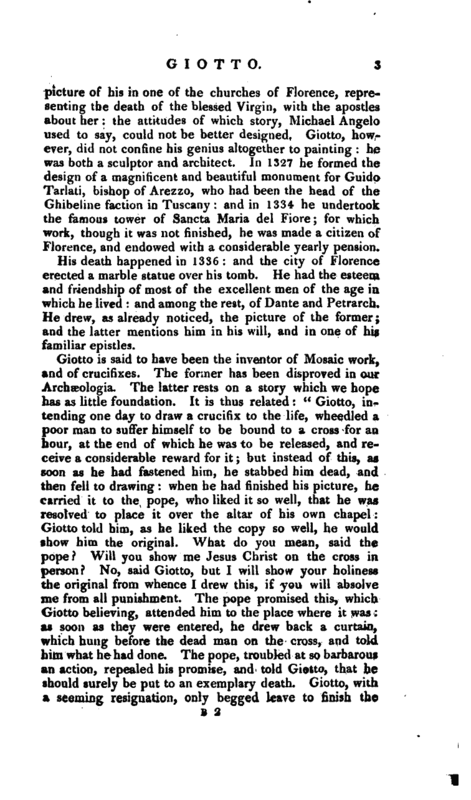 When he came to | Giotto, he told him of the pope’s intentions, which were to employ him in St. Peter’s church at Rome; and desired him to send some design by him to his holiness. 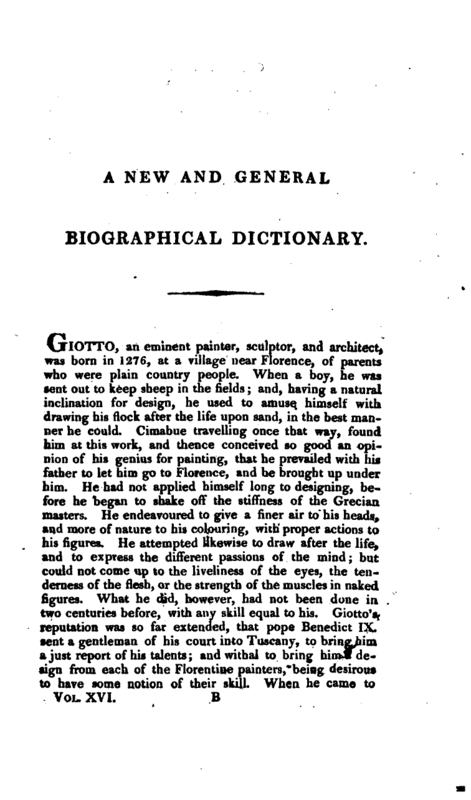 Giotto, who was a pleasant ready man, took a sheet of white paper, and setting his arm close to his hip to keep it steady, he drew with one stroke of his pencil a circle so round and so equal, that “round as Giotto’s O” afterwards became proverbial. Then, presenting it to the gentleman, he told him smiling, that “there was a piece of design, which he might carry to his holiness.” The man replied, “I ask for a design:” Giotto answered, “Go, sir, I tell you his holiness asks nothing else of me.” The pope, who understood something of painting, easily comprehended by this, how much Giotto in strength of design excelled all the other painters of his time; and accordingly sent for him to Rome. 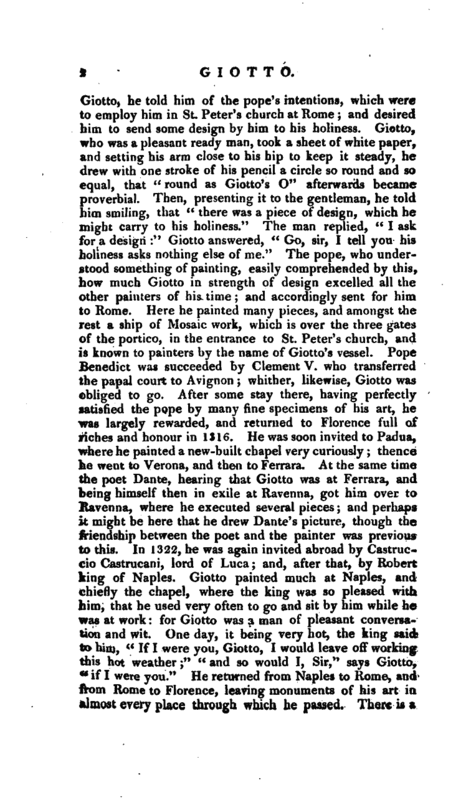 Here he painted many pieces, and amongst the rest a ship of Mosaic work, which is over the three gates of the portico, in the entrance to St. Peter’s church, and is known to painters by the name of Giotto’s vessel. Pope Benedict was succeeded by Clement V. who transferred the papal court to Avignon; whither, likewise, Giotto was obliged to go. After some stay there, having perfectly satisfied the pope by many fine specimens of his art, he was largely rewarded, and returned to Florence full of riches and honour in 1316. He was soon invited to Padua, where he painted a new-built chapel very curiously; thence he went to Verona, and then to Ferrara. At the same time the poet Dante, hearing that Giotto was at Ferrara, and being himself then in exile at Ravenna, got him over to Ravenna, where he executed several pieces; and perhaps it might be here that he drew Dante’s picture, though the friendship between the poet and the painter was previous to this. In 1322, he was again invited abroad by Castruccio Castrucani, lord of Luca; and, after that, by Robert king of Naples. Giotto painted much at Naples, and chiefly the chapel, where the king was so pleased with him, that he used very often to go and sit by him while he was at work: for,Giotto was a man of pleasant conversation and wit. One day, it being very hot, the king said to him, “If I were you, Giotto, I would leave off working this hot weather” “and so would I, Sir,” says Giotto, “if I were you.” He returned from Naples to Rome, and from Rome to Florence, leaving monuments of his art in almost every place through which he passed. There is a | picture of his in one of the churches of Florence, representing the death of the blessed Virgin, with the apostles about her: the attitudes of which story, Michael Angelo used to say, could not be better designed. Giotto, however, did not confine his genius altogether to painting: he was both a sculptor and architect. In 1327 he formed the design of a magnificent and beautiful monument for Guido Tarlati, bishop of Arezzo, who had been the head of the Ghibeline faction in Tuscany: and in 1334 he undertook the famous tower of Sancta Maria del Fiore; for which work, though it was not finished, he was made a citizen of Florence, and endowed with a considerable yearly pension. His death happened in 1336: and the city of Florence erected a marble statue over his tomb. He had the esteem and friendship of most of the excellent men of the age in which he lived and among the rest, of Dante and Petrarch. He drew, as already noticed, the picture of the former and the latter mentions him in his will, and in one of his familiar epistles. 1 Pilkbagton. Vasari. ^glionby’s Lires of the Painters. De Piles.